Where is San Luis Obispo? So, you’ve heard about this coastal paradise called “SLO,” but you’re wondering where San Luis Obispo really is… We’ve got you covered! SLO is perfectly situated along the Central Coast, making it a top choice if you’re seeking a relaxing escape from the city hubs. As one of California’s most beautiful, scenic and happy vacation destinations, San Luis Obispo is known for its friendly locals and laid back atmosphere. Located at the heart of San Luis Obispo County, this small college town becomes the hub for people traveling to the Central Coast due to its close proximity to attractions and other local hot spots. SLO is teeming with things to do whether you’re venturing to the Nine Sisters or paddle boarding at the beaches, sipping at wineries and craft breweries, or exploring the thriving arts and culture scene. You name it, and San Luis Obispo has it. Ideally situated halfway between Los Angeles and San Francisco, San Luis Obispo is the perfect destination during any California road trip down the Pacific Coast Highway or Highway 101. Approximately 230 miles from San Francisco, you can expect to get to San Luis Obispo in three to four hours, depending on the Bay Area traffic. Luckily, once you pass Monterey, you will be smooth sailing until you reach your destination. If you’re headed to San Luis Obispo from the Los Angeles, you can expect around a 190-mile drive to San Luis Obispo, taking about the same amount of time as driving from San Francisco due to varying traffic. Insider’s Pro Tip: Avoid peak rush hour times by leaving the Bay Area or Los Angeles after 10:00 a.m. and before 4:00 p.m. If you’re looking to effectively tour San Luis Obispo, check out our recent #ShareSLO blog on the top historic sites in San Luis Obispo. 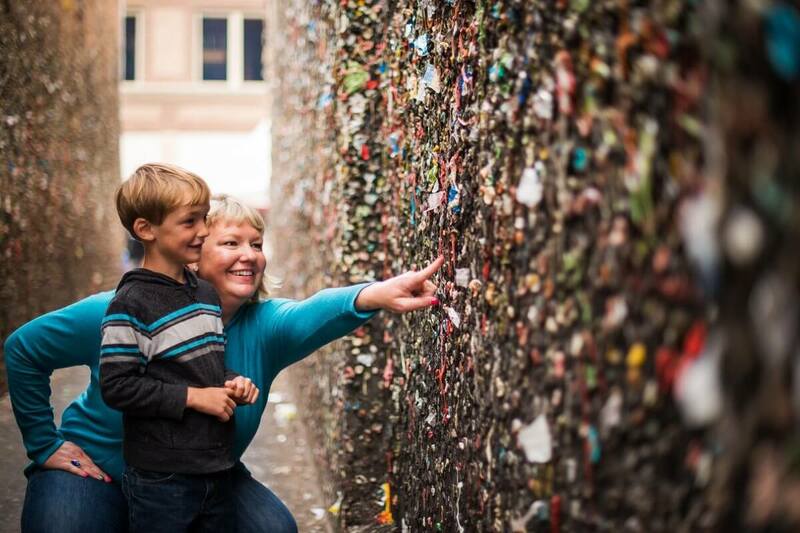 Featuring one of the few remaining drive-in movie theaters and the oldest Bubblegum Wall in the United States, San Luis Obispo has many tourist attractions that visitors won’t want to miss. Enjoy a short drive north up Highway 1 to experience Hearst Castle in all of its magnificence, or swing through Downtown San Luis Obispo to explore the old Fremont Theatre or Mission San Luis Obispo de Tolosa. 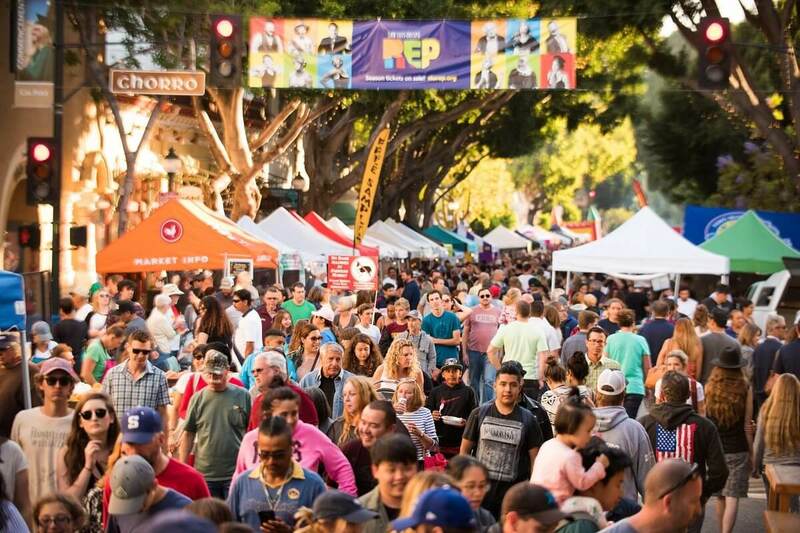 Before you visit, learn about the top 5 things to do in Downtown San Luis Obispo, featuring more lovable landmarks and bucket list activities like Thursday night Farmers’ Market. There are plenty of travel options when looking to visit San Luis Obispo. If you live in California, many people road trip due to its proximity to major cities, but one of the most exciting ways to get to SLO is to take the train, using the Pacific Surfliner or the Coast Starlight. These train routes hug California’s majestic coastline, providing you a thrilling experience while traveling at ease. If the train isn’t your thing, there’s always the bus to San Luis Obispo with daily offerings from Greyhound and Amtrak California. Many of the routes start in the Bay Area, Los Angeles, and the San Joaquin Valley. Seeking something a bit faster? The San Luis Obispo County Regional Airport has direct flights to and from Seattle, Denver, Los Angeles, Phoenix, and San Francisco. Once you arrive, the hub and spoke city layout will work to your advantage since you’ll have everything within reach. While getting around is generally fastest on foot in the downtown area, there are also lots of local transportation options to meet visitor’s needs listed below. Now that you know where San Luis Obispo is, we hope to see you soon – safe travels!